No one thought they’d win. Not the media, not football fans or even the casual observer. How do you beat Tom Brady and a franchise that keeps on winning? How does a city that has never won a Superbowl beat a city that has won 5? How do you take on the greatest quarterback of all time and come out victorious? Whatever you may believe about the Patriots dominance or the Eagles lack of winning championships, both teams found themselves in chilly Minnesota weather playing for the coveted championship trophy. Football fan or not, the Eagles pulled off the ultimate underdog win. How does a no-name, no Championship under their belt, no pomp team come out victorious against one of the greatest teams of all times? The Eagles soared while the Patriots came to a crashing halt. If you walked onto the battlefield against a superior team, you might be shaking in your helmet. If this is you, then you have lost the game before you stepped onto the field, yet the Eagles reminded us that even if you’re seen as the weaker team by everyone else, you don’t have to be intimidated. You show up to win. The only game that matters is the one in front of you today. The Eagles played like confident superstars who had been to the Super Bowl many times before. They took risks including what’s called one of the riskiest plays in sports history called the “Philly special”. Despite the fact they were underdogs, they came in with the confidence of a team determined to win. You can’t go onto the battlefield of life wondering what life or the other team is going to do. All you can do is come in with your own battle plan, your own strategies and your own game. Execute your goals and achieve your plans instead of being preoccupied with what the other side is doing. Play your own game. Don’t give up before you step on the field. Never give up before you start. Don’t let what others say, what the media says and what people around you think, determine the outcome. Create your own game, and achieve your own outcome. Don’t throw in the towel until the game’s over. No matter how much the odds are against you, stay focused on the possibilities. Have hope that you will get through whatever challenge comes your way. Stay focused on your strengths, your preparation and your ability. Play the game that’s in front of you today. You don’t have to play against the legends of the past or heroes of tomorrow. You don’t have to play against the other side’s reputation or history. One play at a time, one day at a time. Don’t remind yourself that you weren’t the best or you’ve lost before or struggled. The past is the past. You’re not the person of the past, you’re the person of today. It’s not about being the very best today. All you have to do in Super Bowls and life is keep getting better than you were before. Always keep improving because your life’s biggest game could be today’s game or the next game. You’re the only one who can believe in yourself. When the odds are against you and the media is against you, all you can do is remind yourself of the work you’ve done, your abilities and the circumstances working out for you. Underdogs usually come in scared and prepared to lose. The Eagles walked in like they were the championship team. They played like they were the top dogs running circles around a more experienced, winning team. Keep pushing ahead. Don’t slow down just because you’re unproven. Go faster, push harder and come in with a winning mentality. Condition your mind to believe that you’re on equal footing as the opposition. Build your skills, your team, your mind and your body. It’s not starting today and it’s not over today. If you’re in it for the long run, keep conditioning yourself knowing your big moment could show up any day. It may be today or tomorrow, but you’re going to be ready either way. The Eagles didn’t just play well on one side of the field. Similarly, you can’t just be good in one part of your life and expect to improve every part of your life. Your personal life, social life and health can improve, because all aspects of your life are tied together. Improve all parts of your life to face your most trying day. You can’t do it alone. While one team had one star that shined, the Eagles had many stars that shined. They came in together as one unit, relied on each other and supported each other. They worked together like a machine, not taking credit for themselves but giving the credit to team-mates, coaches, families and fans. You need a team. One day you may feel like you’re done but the very next day, the ultimate gift could come your way propelling you to success and glory. People give up to soon. 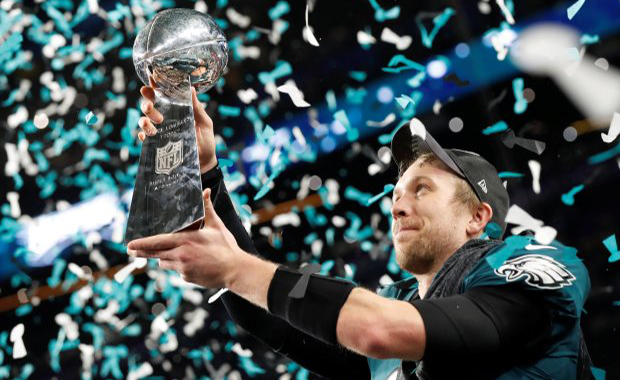 Nick Foles was about to retire last year but hung around for one more year to be the game winning quarterback and most valuable player. Your day of victory may be coming soon, so do not quit before it gets here. What are some life lessons you learned watching the Philadelphia Eagles beat the New England Patriots? Comment below! As a european the superbowl doesn’t really concern me much but great bits of info nonetheless!